Are you an avocado fan? I sure am. I absolutely love avocados on salad, soup, in sandwiches and definitely in guacamole, yum. 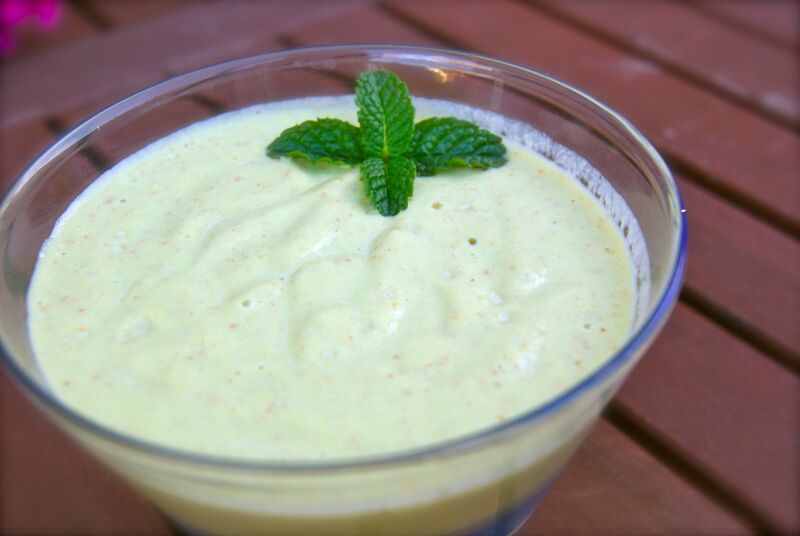 If you share my taste, chances are you are going to love this Creamy Avocado Smoothie. It’s a delicious smoothie packed full of good stuff. It’s filling and will provide you with a good source of fiber, potassium, and vitamin C, vitamin K, folate, and B6. By the way, if you would like to know nutritional information about an avocado here’s a bit of an overview. Half an avocado has about 160 calories, 15 grams of heart-healthy unsaturated fat, and only 2 grams saturated fat. One globe contains more than one-third daily value of vitamin C, and more than half the day’s requirements of vitamin K.
I find this smoothie to be just enough to fill me up as a meal replacement on a busy night! Combine the almonds and water in a blender (Vita-Mix is preferred) and blend well. Slowly add the remaining ingredients until you’ve reached a rich, creamy consistency. Enjoy!